There are several species of ants such as little black ants, acrobat ants, pavement ants, carpenter ants, and many more. Ants can be huge nuisance and recently have become the primary pest infesting homes in recent years. 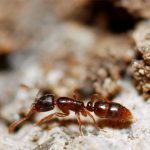 They are very difficult to control and usually takes some skill that is gained through knowledge of ant behavior and experience in dealing with ants. Ants live in colonies and are social insects that have several different types or castes of individuals. Each caste performs a different function or job in the colony. Ant colonies consist of Workers, Reproductives and Swarmers. Ant colonies will mature and spread to new locations. Ant colonies will send out “scouts” to forage for food and fuel in warmer weather. The foraging ants will leave a scent trail to find their way home and leave a path that other ants can follow. Ants can enter your home for many reasons, but more than likely, they are searching for food. Your home maybe close to where a queen decided to set up her colony. Just like humans, ants have to eat to survive. They also have to feed their young. Your home may represent a possible food and water source. It also provides protection from predators and the elements which can serve as a potential site for new colonies when the ants are ready to expand. If you see an ant in your home, don’t just kill it and think you’re done. As a social insect, ants never travel alone. When you kill an ant, it sends out a signal to call for other ants.